The late Soga Machiko in Super Sentai was notorious most of the time for villainous roles. 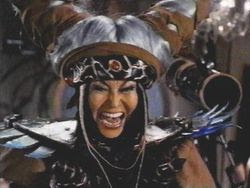 She was Queen Hedrian in Denziman and Sun Vulcan (whether the two are separate characters are debatable) and she was most popularly known as the evil sorceress Bandora of Zyuranger. She also guest starred in Maskman episode 30 as Raraba, Baraba's mother and in Magiranger as Magiel. Hirohisa Nakata appeared in Denziman as a vampire monster who tried to seduce Denzi Pink later appeared as the fearsome Mason of the Big Three in Bioman. Kenji Ohba who is mostly Gavan to the rest of tokusatsu viewers also played as Denzi Blue in Denziman, Battle Kenya in Battle Fever J and he guest appeared in Hurricanger and also in Gekiranger as Jan's father. 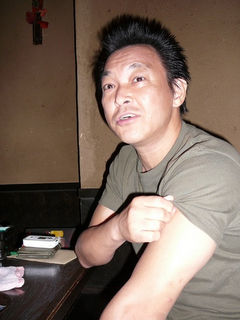 Masashi Mikami won some award for acting. After writing about the rivalry of Ryu Tendo and Guy Yuki, it's worth mentioning of Satoru Akashi and Inou Masumi. Although Satoru Akashi is my favorite character in the show, Inou Masumi seemed to be more interesting for some fans just as Guy Yuki was. Actually the whole point between them may not be as intense but it's still worth watching. The two shared a rivalry throughout the series, a rivalry that Satoru Akashi is kind of oblivious too while Inou Masumi goes to try and outbest Satoru Akashi no matter what. This can be evidenced even in the first episode when Inou Masumi tried to get the Goddom heart to make a fortune for himself. Did Battle Fever J Inspire PR's Multi-Racial Teams? 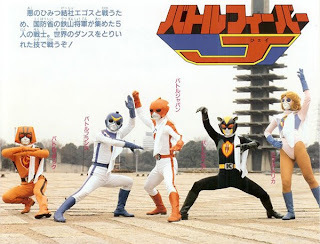 The theme of the first super robot sentai was this "Different nations, one force." The concept was kind of something like red was Japan (the red sun), France was blue (a common color for the french), Cossack was a darker shade of yellow (the color of the hammer-sickle), Kenya was black (African-black people get it?) and Miss America was pink. However they were all Japanese as far as we're concerned. The fact is hypothetically Haim Saban decided to go multi-racial rather than focus on just Americans in doing Power Rangers which he was said to have wanted to start with Turboranger and later Jetman. Maybe he was a big fan of Battle Fever J before he decided to adapt Super Sentai for the American audience. If I'm not wrong he actually did dub Turboranger for the U.S. market but found he needed to "adapt" and so did Toei to penetrate the American market. Hiroshi Watari who played both Metal heroes Spielban and Sharivan (who are NOT each other in contrast to Kamen Riders Black and Black RX) also appeared in Boukenger (in a flashback) as Eiji Takaoka's father and thus explaining why Bouken Silver looks so "Metal Hero" despite the genre being frozen or probably done for as of this moment. His character was that of the vampire hunter who unfortunately fell for a bouma and conceived a hanyo son in Eiji Takaoka who is considered a wandering violent demon by both Gai and Rei. His romance gone bad, he was inevitably killed by the Ashu before becoming Questers for his forbidden relationship. 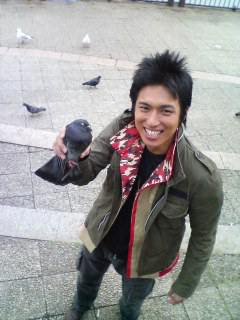 Note: He is currently married to Jun Takanomaki and is retired. This is one classic and cool picture of Toshihide Wakamatsu I found on the Internet and would like to share it with Black Condor fans. In Jetman taking the afternoon off eating watermelon with their chief. However it would have been cooler if they wore by their color coding. The Hurricangers wear their kimono for the new year. The Dekarangers have a very impressive array and my favorite design has to be that of Deka Yellow herself. Boukenger during the new year special... Bouken Yellow has the best outfit here but I still like Bouken Pink best. The Go-ongers wear their kimonos too. 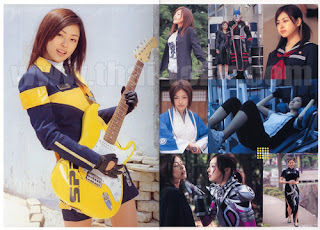 I found this rather cool picture of Natsuki Takahashi who acted as Rin/Phoenix Ranger of Dairanger on the Internet including her grandma attire which is too sloppily done. As of lately, she's retired and gotten married. I wonder who she's married to? Kihachiro Uemara- He was Green Flash in Flashman and later had a villain role as Chevalier in Fiveman. Sayoko Hagiwara (Nefer)- She was also Dyna Pink in Dynaman.